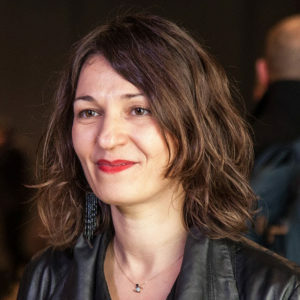 Areti Markopoulou is a Greek architect, researcher and urban technologist working at the intersection between architecture and digital technologies. She is the Academic Director at IAAC in Barcelona, where she also leads the Advanced Architecture Group, a multidisciplinary research group exploring how design and science can positively impact and transform the present and future of our built spaces, the way we live and interact. Her research and practice seeks to redefine architecture as a performative “body” beyond traditional notions of static materiality, approximate data, or standardized manufacturing. Areti is founder and principal of the multidisciplinary practice Design Dynamics Studio, and co-editor of Urban Next, a global network focused on rethinking architecture through the contemporary urban milieu. She is the project coordinator of a number of European Research funded Projects on topics including: urban regeneration though technologies, dynamic design through novel materials and multidisciplinary educational models in the digital age. Areti has also served as a curator of international exhibitions such as On Site Robotics (Building Barcelona Construmat 2017), Print Matter (In3dustry 2016), HyperCity (Shenzhen Bi-city Biennale, 2015) and MyVeryOwnCity (World Bank, BR Barcelona, 2011). She holds a Bachelor of Architecture & Engineering from DUTH – the Democritus University of Thrace, a MArch from IAAC, and a Fab Academy diploma on Digital Fabrication offered by the Fab Lab Network. Her work has been featured in numerous exhibitions worldwide, such as the Venice Biennale, Shenzhen Bi-City Biennale, Centre Pompidou, MAXXI and Beijing Design Week among others.